That's five year old JKM as The Six Million Dollar Man! Given my penchant for horror films, it won’t surprise you to learn that Halloween is a big holiday at the Muir house. I still dress up along with Joel every October 31st, and head out into the neighborhood collecting candy. We have one amazing neighbor up the street who only gives out “movie”-style candy, giant, over-sized boxes of Raisinets and the like. I pretty much have to muscle my seven year old out of the way to get to them. Just kidding. I let Joel get the loot. My love of Halloween goes back to my earliest memories in the seventies. I grew up in Glen Ridge, New Jersey, a picturesque Essex County suburb, and the trick-or-treating there was pretty great. Glen Ridge is a small town, so a kid could cover a lot of ground in one night, if he or she was willing to do a lot of walking. My sister and I would get started on Halloween at about 4:30 pm (in costume), trick-or-treat for an hour, eat dinner, and then go back out and trick-or-treat until nine o’clock at night. Then, we’d return home, dump our bags out on the kitchen table, and assess the sweet loot. 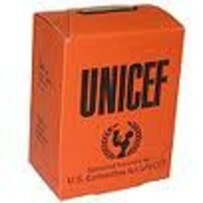 For many years, it seemed, we went trick-or-treating “for UNICEF” (United Nation’s Children’s Fund) as well, and I still remember carrying along those little orange boxes filled with change. Part of the fun of Halloween in the 1970s involved those classic, if flimsy, Ben Cooper costumes of the era. One year, I went out trick-or-treating as Ben Cooper’s Steve Austin, the Six Million Dollar Man. As you can tell from the photograph, however, I look more like President Ronald Reagan than Colonel Austin. Another year, I went out as Ben Cooper’s Darth Vader, and the next year, as the same company’s Cylon from Battlestar Galactica. If I’m being honest, these costumes weren’t really very good, and certainly not “show accurate” to any degree. And after a long night of wearing those masks, they always smelled like sweat. I still went trick-or-treating in high school, and one year dressed up as Freddy Krueger. I had an Indiana Jones fedora, a red-and-white sweater, a Freddy glove and a pull-over mask. Instead of focusing on trick or treating, however, I focused on scaring my sister. I remember that I waited until it was about 8:30 pm, and I found a great perch at the nearby railroad tracks where we had often played as children. The tracks were near -- I kid you not -- a graveyard. As my sister crossed the railroad tracks on her return journey, I jumped out from behind a tall signal post and scared the heck out of her. And man, was it fun. It’s Halloween. Everyone is entitled to one good scare, right? Actually, I had my own bad scare one year while trick-or-treating in Glen Ridge. I think I must have been nine or so at the time. I’m pretty sure it was the year I went out as a Cylon. There I was in my costume, collecting candy in Glen Ridge, when I approached a large suburban house from the side. I should have stayed in the light, and out on the front walk. Instead, I ran up the side yard trying to beat the other kids. I ran by a large hedge, and then quite unexpectedly fell into a seven or eight foot hole, dug right out of the yard. It was quite a shock. I remember wondering what the hell happened, but fortunately I was rescued after about a minute or so “buried alive” in that ditch. Just a week until Halloween now, and I’m super excited to go out trick-or-treating with Joel. He’s dressing up as The Grim Reaper, and I’m probably going (again) as Mr. Spock, as I often do. I’ll make certain, however, we both stay on the path, and avoid any ditches…or dream demons. John as I write this on Halloween night I have nothing but fond memories of my boyhood in the '70s and especially Trick or Treating. Your thoughts here capture what it was like back then to be a kid at Halloween. Your adventures both with your sister then and now with your son Joel are what memories are all about. The closest I came to a scare on Halloween night was in the late '70s, but nothing like your shocking fall into that deep hole. That would have scared the [expletive deleted] out of me at that age. I am glad you were not hurt. My scare happened while dressed in a homemade Darth Vader costume. The Darth Vader helmet was fabricated on a real motorcycle helmet. I grew up in a suburban town too. However, on a poorly lit street, in the dark, while moving with my costumed friends and siblings I tripped on a railroad tie on the edge of a driveway. I fell flat on my face which was protected by a hockey goalie mask converted into Darth Vader's face mask. Albeit, my Darth Vader helmet just flew off my head, like a runaway projectile, and bounced down the gravel covered driveway. John your fall was scary, mine was comical. Like you, being a boy on the hunt for candy, I just got up and found my helmet and put it back on my head. Halloween was always fun for me because by October 1st I would know what I wanted to be. I would either purchase a costume like you or fabricate it as I got older in my boyhood. Good memories. I hope that Halloween was fun tonight for both you and your son. Thank you for sharing your own memories of Halloween in the 1970s, my friend. I love to think of you as Darth Vader, not so much falling on your face! :) That sounds like it was painful, and I can imagine the helmet bouncing down the driveway! We had a great Halloween last night. Joel loaded up with candy, and we were both happy because one lady at the door told Joel that (as the Grim Reaper) he scared the "living daylights out of her.!" It's Halloween, everyone deserves one good scare, right?! Good to knew that Joel and you had a happy Halloween! That was just a wonderful reflection John. It inspires me to do something of my own for next year. Thank you.